The CTA405 is an integrated valve amplifier with five line-level inputs, including a tape monitor loop, and a built in RIAA phono circuit accommodating moving magnet and high output moving coil cartridges. 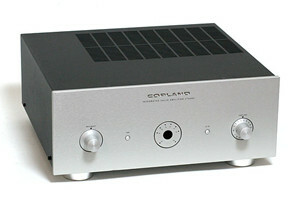 A complete line stage similar to the one found in the Copland CTA305 preamplifier is installed separately together with a dedicated power supply, providing a low output impedance buffer between the amplifier interconnect cables and the level control prior to the power amplifier. The push pull output stages consist of a pair of matched 6550 power valves in fixed ultra-linear configuration, delivering the low distortion of triodes combined with the power of tetrode valves. The operation point of the output stage is set for class AB operation. In practice, this means that the first 50% of the output power is provided in class A condition. The output transformers are highly critical components of the valve amplifier. Decades of experience in this particular field of audio electronics are incorporated in our design of these critical parts of the valve amplifier, and excellent specifications can be measured at more than twice the rated output power of 50 W per channel chosen for this construction. Due to the outstanding performance of the Copland output transformers, superb linearity is achieved before feedback is employed; reducing the requirements for internal lag compensation networks and ensuring high stability after the 18dB negative feedback loop is closed. The CTA405 is able to provide what we consider an extraordinarily accurate reproduction of music without any tendency towards listening fatigue, featuring strong dynamics and a wide flexibility in the choice of speakers. The CTA405 employs motor driven volume control and can be fully controlled by the Copland RC102 remote control unit. Durob Audio is the exclusive distributor for Copland in the Benelux. For more information please visit our website: www.durob.nl or call us! Dit bericht werd geplaatst in Algemeen info - Informations générales, Copland, Dealers - Revendeurs, Versterkers - Amplificateurs en getagged met copland, durob audio. Maak dit favoriet permalink.